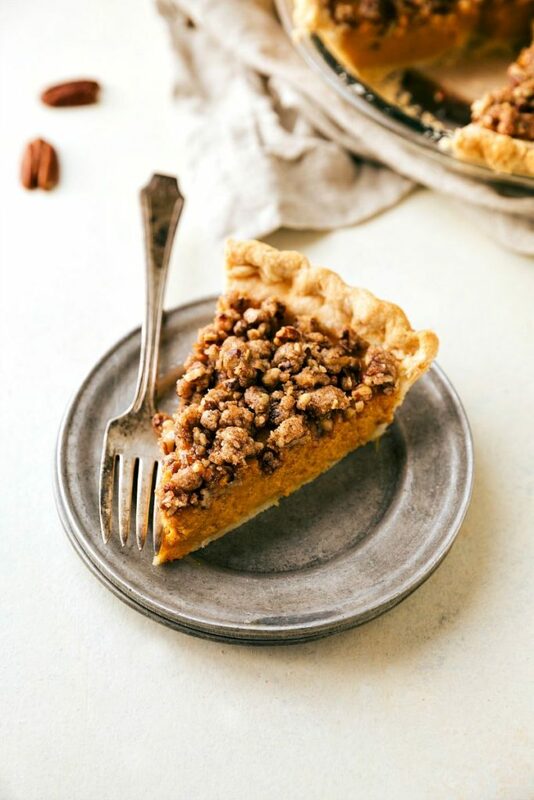 A simple-to-make pumpkin pie with a delicious sugary-pecan streusel. The (optional) two-ingredient maple whipped topping takes this pie over the top! Use 3/4 cup of the pecans you prepared on day 3. Toss together the flour, salt, and sugar. Dice the extremely cold butter into small pieces and add to the bowl along with the cold shortening. Cut the butter and shortening into the flour with a pastry blender or two knives until the dough forms coarse crumbs. Very slowly, add in 4 tablespoons of ice cold water -- add 1 tablespoon at a time until the dough can form into a ball. Stir the mixture a few times with a wooden spoon and then spoon it all onto a large sheet of plastic wrap. Knead just a few times to get it into a ball and then wrap tightly in the plastic wrap. Chill for at least 30 minutes up to overnight. Whisk the pumpkin puree with 1 large egg, and 3 egg YOLKS. Once combined whisk in the sweetened condensed milk. Add in the cinnamon, ginger, salt, nutmeg, and vanilla extract. Whisk until combined. Roll out the pie dough (I roll the dough in between two sheets of plastic wrap) and fit it into a 9-inch pie pan. Fold the edges up one time and then crimp those edges with your fingers. In a small bowl, whisk together the egg and milk and brush that over the crust. Add pie weights to the crust (Or put foil in the bottom and fill it with dried beans or rice). In a small bowl, whisk together the egg and milk and brush that lightly over the edges of the crust. Bake just the crust for 10 minutes. Remove the pie and pour the filling into the pie pan. Tap a few times to release extra air. Put in the oven and bake for 15 minutes at 425 degrees F. Then reduce the heat to 350 degrees and cook for another 25-30 minutes. Meanwhile, chop the pecans into small pieces. Toss the pecans with the brown sugar, flour, and cinnamon. Finely dice the cold butter and then using a pastry blender (or your hands), cut it in with the other ingredients until a thick streusel is formed. Remove the pie after cooking for 25-30 minutes and top it evenly with the streusel. Serve the pie chilled or at room temperature. In a bowl of a stand mixer, pour in the cold heavy whipping cream. Whip for 1-2 minutes and then gradually pour in the maple syrup. Generously spoon the maple whipped cream over the pie and enjoy!